A few notes: these requirements only apply to as-of-right development which is not subject to Large Project Review. They can also be superseded by Planned Development Areas. Each neighborhood zoning code seems to have its own way of wording things, so I've simplified a bit. These requirements only apply to normal or "other" residential development (not elder housing, etc). Some codes categorize by "1-3 units", others by "1-4 units" and others not at all. So I've settled on "1 unit", "5 units" or "10+ units" as intermediate samples. 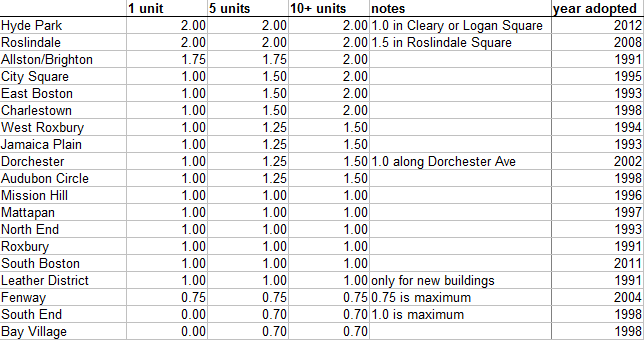 As you can see, much of Boston suffers from higher minimum parking requirements, particularly on multi-unit buildings. I find it quixotic that larger multi-unit buildings have to comply with even more onerous parking requirements, when typically such buildings would be found in densely populated areas close to transit. I suspect that this forces most larger buildings into Large Project Review in the process of receiving variances. It's also the case that the zoning code does not distinguish between a studio and a 3-BR apartment when it comes to parking requirements. How many people living in a studio really need 2 parking spaces? Probably a very small percentage, if any. It's pretty appalling that the North End is subject to any minimum parking requirement at all, considering that at least two-thirds of the residents do not have a car. By contrast, the South End and Bay Village have at least reduced that to 0.7 and do not require any parking for small projects. The way Allston is lumped together with Brighton with very high minimum parking requirements is another example of bad zoning. In fact, the neighborhood boundaries don't make sensible planning areas here at all, due to geography. The sections of Allston/Brighton within a few blocks of Comm Ave -- from Packard's Corner to Cleveland Circle -- are almost all densely populated, with low car-ownership, and high transit use. Requiring 2.0 parking spaces per unit there is simply insane, and out of character with the existing built environment. 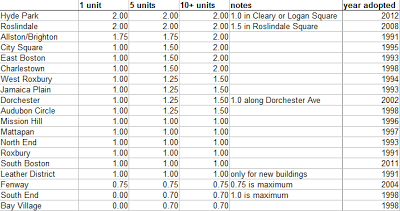 I happen to know that the people who worked on this particular neighborhood code largely live in the suburban outer reaches of Brighton, and it was wrong to impose their schemes on Allston and Comm Ave.
Roxbury, South Boston and Mattapan only require 1.0 per unit even though they are less densely populated than Allston. Roxbury has a lower car-ownership rate than average, Mattapan is about average, and South Boston is higher than average. I don't know how they arrived at these decisions. But it all seems pretty arbitrary, which is a terrible rationale for a regulation that increases housing costs and decays neighborhoods. The BRA should really revisit all of these codes and revise downward or outright eliminate any minimum parking requirements. Most of them are 20 years old. A lot has changed in the way people think since the early 90s. The minimum parking requirement is a measure intended to subsidize parking in the city, to force everyone to pay for an amenity that only some may use. Nowadays we recognize that adding parking creates traffic, that it reduces opportunity, raises housing costs, and deadens neighborhoods. There's no good reason to subsidize it; the market is perfectly capable of supplying parking to meet demand, and it should be treated as just another land use. Even places where car-ownership is high do not need minimum parking requirements: why would developers build something that they couldn't sell? Nobody expects to be given a free 200 square feet of floor space for any other use, and I don't see why parking should be the exception to that. Thanks for compiling this data. I wonder whether the higher minimums for multifamily housing are due to existing residents’ fears of spillover parking expressing themselves through the parking requirements? One might expect the requirements to run in the opposite direction. I think it is fear of spillover parking, at least judging from comments at meetings. Lots of complaints about new residents possibly coming in and taking up "their" parking spaces on the street. There's no consideration at all of whether protecting "free parking privileges" for a select minority is a worthy policy goal to be pursuing. Parking minimums are almost certainly a reaction to fears of "spillover", at least initially. But that doesn't explain the case of Providence, where overnight on-street parking is prohibited categorically. I suspect to some extent they also exist because everyone else has them, and city bureaucrats think that that's the way cities are supposed to be. After all, there's probably some really good reason why everyone else has them, so we should have them too. How big does a parking space have to be? Guidelines vary, but off the top of my head, 16' by 9' or 16' by 10' seems typical for the space needed to store the vehicle while it is parked. That's 144 to 160 square feet. Then you have to figure maneuvering space, which depends highly upon the particular arrangement of the parking spaces, the parking structure, and the surroundings. For a general purpose parking garage where you want each space to be independently accessible by any kind of vehicle, the driveway square footage could easily be as large as the storage space. So, in such a place, if you divide overall garage square footage by number of parking spaces, then that could come out to something like 300 square feet per parking space, on average. That's why developments are always looking for ways to save on space in the garage, and yet another reason I can add to this 3-yr old blog post on why minimum parking requirements have nothing to do with reality. The usable square footage of a building's parking garage is determined by the site shape, access and geography. Those are largely independent factors from the number of dwelling units in the building. Developers take the garage space that the site allows, and try to divide it up into parking spaces however they can, in order to try and meet the artificially high ratio imposed on them for political reasons. It's absurd.